ATLANTA -- Israel Adesanya came to UFC 236 looking to prove himself, once and for all, on the highest level. He left the Octagon with the interim middleweight title and the fight of the year in one of the most dramatic bouts in UFC history. "I was ready for war, I told y'all," Adesanya said. "I wanted to take him out but I was ready for war because he is Mexicano. [Critics] talk s--- but they ain't ready for this." Just two months after he took a decision from 43-year-old legend Anderson Silva, Adesanya came back on a quick turnaround to capture the interim title at 185 pounds and set up a showdown with full champion Robert Whittaker later this year. Whittaker pulled out of his UFC 234 bout against Gastelum in February following emergency bowel surgery. The fight turned out to be an epic pairing of two strikers in their physical primes that only got better as the rounds wore on. The 29-year-old Adesanya, a native of Nigeria who fights out of New Zealand, battled through a swollen face and a cut below his right eye. Gastelum (15-4, 1 NC), meanwhile, was beaten to a bloody mess in the final 30 seconds when he was floored twice but he refused to quit and was lucky to see the final horn as referee Marc Goddard gave the brave Mexican-American fighter every opportunity to survive. "There's someone who is more of a man than me," Adesanya said of Gastelum. "I've planned this for so long. Without you my career wouldn't be where it is. " "I don't think about scorecards, all I need is one round. I have a tattoo of a heart of a lion on my chest. I was ready to die. We have lost teammates to this game that aren't here anymore. I was willing to give it all to this game and let it go. He's a Mexican warrior, but I've got some Mexicano in me too." 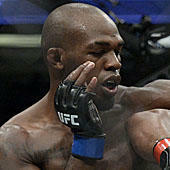 Adesanya had been dominant coming in through five UFC wins and looked to be the promotion's next big star in waiting. But he had never been tested on the elite level and started slow as Gastelum beat him to the punch in the opening round. Eventually, Adesanya began to make adjustments and teased danger by standing in front of the 27-year-old Gastelum at close range throughout only to slip punches and counter with accurate shots thanks, in part, to his tremendous footwork and ability to switch stances on the fly. The first three rounds, which were largely operated at a tactical and quick pace, gave way to hectic madness over the final two rounds as the fight turned into a brawl. Gastelum rocked Adesanya with a head kick late in Round 4 but twice chose to go for takedowns in the final minute and was stuffed despite having Adesanya hurt. For as much as social media lit up calling Round 4 the round of the year, the final round was even better. Gastelum broke free from a guillotine attempt that appeared to have him in deep. After reversing to regain top position, Adesanya applied a head-and-arm triangle choke that saw Gastelum on the verge of tapping out. Instead, Gastelum broke free once more and rallied with clean punches until Adesanya began to line him up, dropping him twice in the final minute. "I wasn't able to secure the position like I wanted, he was slippery," Adesanya said.